Flash memory can't boast of high operating speed: it's comparable to optical discs but much slower compared to modern hard drives. However, the speeds they have reached by today are enough for carrying over information and usage in portable devices. Also remember that the flash memory is taking great strides forward and the prices are falling down even quicker. But further popularity of the technology is limited by the interfaces. The data rate between computers and players, photo cameras, flash drives and card readers is limited by the good old USB 1.1. But don't worry: there are two high-speed buses - FireWire and USB 2.0 which are now battling on the market. The former is not widely used in PC machines (though it has become a standard on the MACs), while the other faces an excellent future as it's an extension of the previous standard and physically compatible with it (the speed will certainly be limited by capabilities of the first version). The manufacturers can easily switch to the new standard as they have to replace only one chip. Moreover, almost all modern chipsets support the new standard, and you can use extension cards for old machines (not to mention that the respective controllers are often soldered out on mainboards developed during the last year). The FireWire doesn't have such a promising state of affairs because it's compatible only with itself. But it has a lot of advantages as well. How come that two comparable buses pretend to the same niche? Three-four years ago the situation wasn't so complicated. 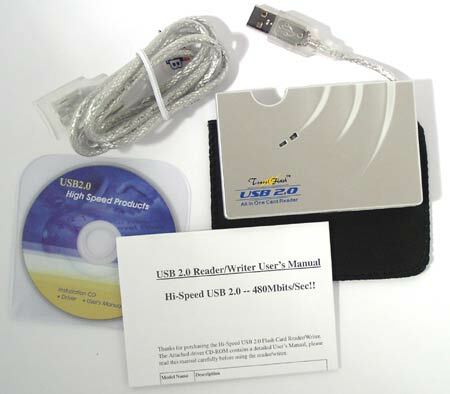 It was considered that the USB was to be used for low-speed devices and the IEEE1394 (FireWire) for high-speed ones. Intel promised then to integrated the FireWire controller into its chipsets. But a little later it changed its attitude toward the standards developed by anybody else. As a result, it put on the market two crippled buses to compete against the FireWire which could be equally used both for internal and external devices, - SerialATA for hard drives installed inside PC cases (it also replaces the usual ATA though the speed of the current version of the mod SerialATA is lower than that of the ATA133, though they claim the opposite) and USB 2.0 for external devices. Each of these buses is weaker than FireWire, but they are backed by Intel. However, it doesn't mean that FireWire will have to sink into oblivion. Firstly, this bus has already become a standard for Apple Macintosh, - although this market is not very wide, the companies do not ignore it. Besides, it's also a standard for non-computer equipment, in particular, for digital video cameras. Thirdly, it supports operation in the p2p mode, instead of "master-slave" which allows two devices to be connected directly without a computer, and makes possible to create PC based networks without any expensive components (two computers connected via FireWire will be a cheaper solution than via USB, even taking into account the adapters' cost, not to mention a greater number of machines). Finally, USB 2.0 is developed for 480 Mbit/s and it's questionable whether it can increase its speed maintaining the compatibility. The first version of the FireWire has a specified speed of 400 Mbit/s, and in practice FireWire devices usually work faster than USB 2.0. Today we have the GigaWare standardized - the extension of the bus of 800 Mbit/s (support of UTP cables 100 m long makes the IEEE1394b a powerful competitor against the Gigabit Ethernet) and further modifications for the speeds of 1.6 and 3.2 Gbit/s (which are not standardized yet). Certainly, the compatibility will be preserved. By and large, with the FireWire you will hardly become limited by the bus throughput, while the capabilities of the USB 2.0 are already not enough for operation with hard drives. This situation looks very similar to the battle between VLB and PCI which took place 7-8 years ago. Again, we have one bus which is inexpensive and compatible with the past, and the other which needs investment and new equipment but works for future. You know who won last time ;) Although the FireWire is making its way very slowly, it does get popular. Connectors of this bus are more and more often used on mainboards, and it's already typical of notebooks to have them. Creative has made a big contribution into making the FireWire popular by incorporating the FW port (to which you can connect more than one device) as a standard element of its sound cards. After all, a PCI-FireWire adapter is cheaper than a respective one for USB 2.0. In general, there are no limitations for further growth of speed of the peripherals irrespective of what niche will get more popular. While for flash drives it's better to use USB 2.0 (it's easier to switch to this bus and you mustn't disregard a situation when you might need to load data into a computer which has nothing but the first version of the USB), users of other devices will win irrespective of which one is staked on. Today we will take a look at a small part of the fast growing market of high-speed peripherals, i.e. 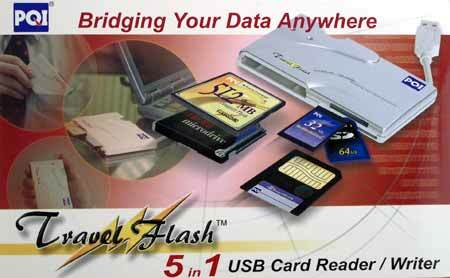 we will deal with the card readers, in particular PQI Travel Flash, a multiformat reader supporting USB 2.0. In the tests we aim to compare it with the devices meant for USB 1.1 to find out what performance gain should be expected in case the new standard is widely accepted, and compare the given car reader with the FireWire device to find out which is is more optimal. Besides, we are going to compare card readers of different types used with the same equipment (especially, a comparative speed of MMC and SD). As the market offers a lot of formats, a multiformat reader turns out to be a justified device, especially because its price is comparable to uni-standard devices. The first card is CompactFlash. It's one of the oldest standards which, nevertheless, is not going to give up. 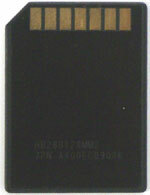 Such cards provide the highest data rates and biggest capacity - up to 1 GB (there are also some samples of 3 GB). Their characteristics excellently suit for digital photo equipment where they take the first position. They are also often used in pocket computers, but not in players because CF cards are quite big and have a complicated interface - ATA with all its strong and weak points (including a multipin connector which is difficult to use on microplates but easy to break). 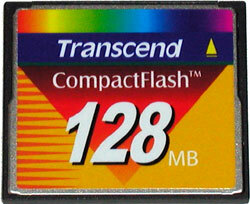 In the tests I used the Transcend's card of 128 MB which is a current leader among these cards according to our tests. SmartMedia. It seems that its days are numbered though such cards are very widely spread today, they are used mostly in digital players and photo cameras. Its advantage is simplicity, in fact, it's just an extension of pins of the flash memory chips. SMC are the only cards without a controller. They don't have many pins which makes layout of the slots simpler. These cards are almost equal to CF in length and width, but they are much thinner; they are actually the slimmest cards on the market. But their quite low data rate and small capacity (128 MB at most) grant no prospects. In the tests we used the card of the maximum capacity on the Samsung's chip. 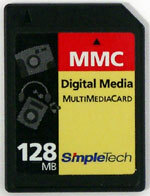 MultiMedia Card. The name implies what for such cards were developed. The developers were going to make a miniature storage device suitable for any multimedia device. That is why the cards have a small number of pins (7) of the series (in contrast to the previous ones) bus. But then it turned out that the bus is not very efficient, as well as has some other downsides; that is why the developers offered another standard quite soon, but the companies who invested a lot into MMC took it quite chilly. Memory cards of this standard and devices supporting only MMC are still produced (MMC cards can also be used in any device supporting SD). But this standard has no future. 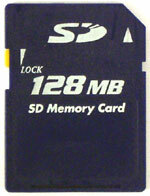 128 MB cards were standardized without much enthusiasm, and they are not supported by many existent devices. No greater size is expected. In the tests we used the Simple Technology's model of 128 MB. This company was first to start production of such cards and make the market to accept this standard. Besides, the ST products are, as a rule, high-speed, and we should expect that ST will take as much benefit from MMC as possible. Secure Digital Card. The developers of this type tried to retain all advantages of the MMC and eliminate the shortcomings. The cards have the same dimensions, only a tad thicker. They need 9 pins, it's a bit more compared to the MMC, but much less compared to 50 of CF. For data transfer one, two or four pins can be used, which maintains compatibility with the serial MMC and makes possible to transfer a byte per two clocks instead of 8 in case of MMC. The clock speed of the bus is increased by 25% (25 MHz against 20 MHz). Together it makes the throughput 5 times greater which is sufficient for most tasks today and tomorrow. The capacity has already reached 512 MB, and 1 GB is expected very soon; 2GB samples were already demonstrated as well. The developers paid due attention to safety starting from integrated data encryption means to a write protection slider. Well, the SDC is a direct competitor for CF outshining the latter in many parameters. Though it's also more expensive :) The spreading could be faster if they provided the back compatibility with MMC promised previously. However, the cards differ in size and incompatible in the protocols. Operation of a SD device with MMC is, in fact, emulation of an MMC device. But anyway, it's very possible that the SD will become the main standard in the near future. The market offers today a great deal of devices meant for exactly this standard. Since the other tested cards are of 128 MB, I have taken the SDC of the same size, though more sizeable samples are also available. I used the card from PQI; some tests dealt with the Kingston's model of 64 MB, but its scores were the same, that is why I don't publish them. As you know, all companies are divided into three categories: those who establish standards, those who work in compliance with standards and Sony which develops its own standards for all spheres of activity. Sometimes the company is lucky, and its standards are accepted throughout the world, for example, Audio CD and 3.5" floppy. But sometimes the company develops something strange or inferior to the existing standards (MD or SACD). Which category the Memory Stick refers to will be clear in future, but I'm almost sure that to the second one. It's similar to MMC in speed and to SD in data protection, and it's bigger than the other two (though there is a MS Duo version with smaller dimensions) and has problems with the memory size over 128 MB. The MS can be blue or white, on the latter you can store music. Well, you can store on both, but a player can't play files from the blue one. The white is more expensive because its price covers license payments to sound-recording companies (i.e. Sony :). I used a blue memory stick from Sony of 128 MB. The card readers are four: the today's hero, two on similar controllers but for USB 1.1, and one for FireWire. This is in fact a forefather of the line appeared a bit over a year ago. It attracted users immediately with its compact size and support of several formats of flash cards, but it's not deprived of disadvantages. The card reader measures just 63 x 98 x 11 mm and nicely fits a pocket. On one side it has a short USB cable which you can put inside the case. The reader comes with a non-standard USB extender (the socket build allows using it only with Travel Flash line). There is also a CD of the business card form- factor with the drivers for Windows 98, driver update for Win2000 (though the devices perfectly operates without it, and drivers are not required for ME and XP at all) and a user manual, a leatherette cover and a brief printed guide. All the stuff is packed into a cardboard box. The front panel of the device has slots for different types of cards. CompactFlash Type II and SmartMedia are always provided. The third slot depends on the version: the first version had MMC, the following ones - SD. Besides, both types had a modification with integrated flash memory, though they weren't much popular. 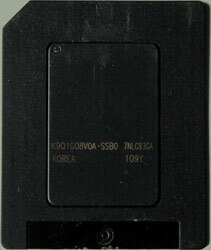 The "5 in 1" became the most widespread: SD slot, no integrated memory. 5 means the number of cards supported: CompactFlash, Microdrive, SMC, MMC and SDC. Two LEDs located above will tell you what the reader will do. Its weak point is a low speed because of the controller. The downsides of the original version were soon eliminated. Also, they added the Memory Stick support, though it wasn't the right solution, because many users knew they wouldn't need Memory Stick and went with the Travel Flash 5 in 1 instead of All in One not realizing the difference in speed. The All in One looks like the Travel Flash except an additional slot (though it's combined with the SD slot) and minor differences in design of the upper panel. The accessory pack is entirely the same. I didn't have the device itself, but I didn't need it, - I took the X's-Drive which uses the same controller. It's clear that one would hardly use this interesting device only as a card reader, but I will show you its results in this mode as they are similar to the Travel Flash All in One (the other features of the X's-Drive and its competitors will be described next time). This device is a good example of how easy it is to switch from USB 1.1 to USB 2.0. When the new controller was released, PQI announced the Travel Flash. It looks very similar to the previous All in One, only the USB cable and extender have become semitransparent with a metallic tint instead of gray, and it acquired a sticker "High Speed". The gadget is packed into a semitransparent plastic box, and supplied with a 3.5" CD. This reader was used in the tests of CompactFlash cards carried out some time ago. 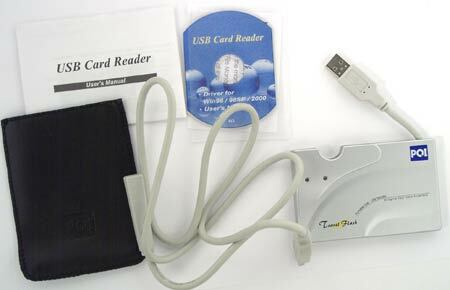 This is a one-standard card reader with the FireWire interface. 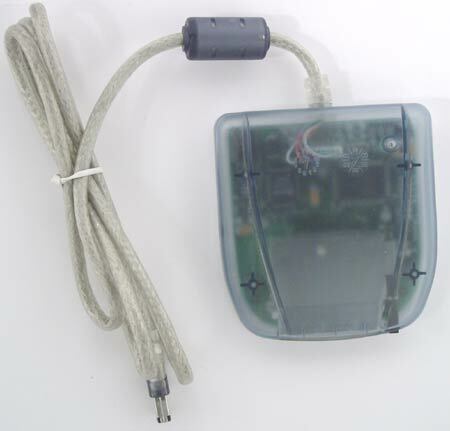 The body, which is quite big, is dead connected to a long FW cable. The device ships in a surprisingly big box which contains nothing more. The user guide is entirely on the box (well, in fact, the operation is very simple to write much about it) and FireWire devices don't need drivers because operating systems supporting FW do have them by default. Even the Windows 98, which needs drivers for USB equipment, works perfectly with the FireWire drive without them. The device supports only one standard, but I decided to test it with CompactFlash and SmartMedia as well (through the Delkin eFilm SMC to CF adapter). Surely, the adapter must affect the scores, but still it's possible to make some estimation (DataFab also produces a special SmartMedia reader which is entirely identical to the tested version except the card type; unfortunately, I couldn't get it). The test computer is based on the VIA KT333 mainboard, Athlon XP 1900+ CPU and 512 MB PC2700 memory. As USB 1.1 we used a controller integrated into the south bridge (8233A). The devices were connected in turn to the first channel. 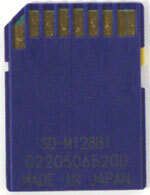 The USB 2.0 was supported by the PCI adapter based on the NEC's chip. And I used the FireWire controller installed into the Audigy (unfortunately, both FireWire ports on my video card are not powered, that is why they perfectly suit for devices with a separate power supply unit, but not for card readers). Everything worked under Windows XP Pro. Ziff-Davis Winbench 99 and HD Tach 2.61 were used to measure the speed, but taking into account that the former doesn't measure the write speed and both have identical access time and read speed (accurate within the precision of measurements), the diagrams show the results of only the second program. First I measured the access time. In case of the CF, MMC or SD it's quite good, - the scores correspond to the X's-Drive and are better than shown by the original version of the controller used in the "5 in 1". However, for the SmartMedia it makes 360.9 ms (more than a third of a second) and for the Memory Stick it's 149 ms. These cards work slower than the others in other cases as well, but not to such extent! I even tried an old SMC card of 16 MB, but it proved the data. Such a great access time was noticeable by eye as well: when I tried to look through the properties of the disc in the explorer, it responded with a considerable delay. All in all, it's the internal problem of the controller or its partial compatibility with the USB 1.1 which can cause such a behavior (first I thought the problem can be on account of realization of this standard in the VIA's chips, but all previous versions disprove it). In the second part, where the drive is tested in its own mode, we will clear it up. Now the read speed. The "5 in 1" works more or less good only with the SmartMedia. 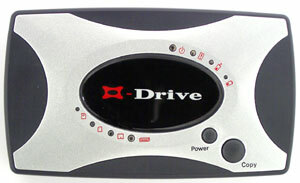 The X's-Drive is limited by the USB bus, which means at least that they have eliminated all downsides in this controller. Our hero performs similarly. It looks a bit inferior in case of the CF, but takes the lead with MMC or SD. In the write speed tests the layout is the same, only the 5 in 1 lost its last attractive features. The X's-Drive and Travel Flash USB 2.0 went on a par. That is why those who buy the reader with the USB 2.0 interface with an eye to future may not worry: they lose nothing even if they use the device with old controllers. In theory, the SD is 5 times faster than the MMC, but in the tests the MMC is 1.5 faster than the other recording having the same read rate. However slow the MMC may be, it easily covers the speed of USB 1.1. That is why everything is limited by the chips. Simple Technology used a faster flash chip, PQI and Kingston integrated a slow model, that is why the MMC of the former outpaced their SD. As we found out, connection of the USB 1.1 equipment to a higher-speed controller results in no performance gain. That is why those who need a high speed should choose only among USB 2.0 and FireWire. Which one is stronger? When we switched the Travel Flash to its own controller, the access time became lower, but not for SmartMedia and Memory Stick: 347.6 and 141.9 ms - although the figures are better, the difference is actually useless. Now we can see that such a high access time is on account of the crippled controller. 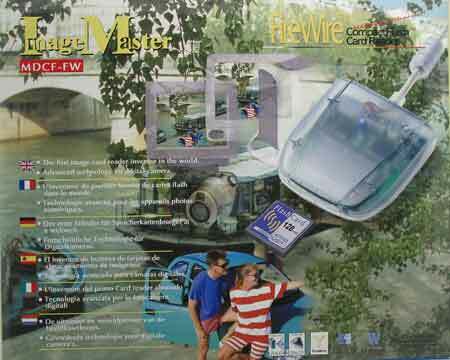 The ImageMaster showed perfect results (even the additional adapter for SmartMedia wasn't an obstacle). The leader in reading is the tandem of CompactFlash and ImageMaster. The Travel Flash does have some problems with the CF as well, but it jumped forward with the SmartMedia. The high access time didn't prevent its reaching a high linear read speed. The MMC and SD have quite interesting scores. Without the fetters of USB 1.1, both cards turned to be more efficient. 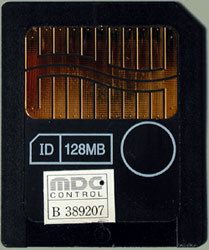 ST uses the high-speed chips, but the slow serial interface of MMC lets the card reach only 1.5 MB/s. In SD cards I had the flash memory chips weren't the fastest but, still, the cards performed pretty well - over 3.5 MB/s; they managed to outscore even the CompactFlash in the same conditions. In theory, the speed can be increased approximately twice. In general, the SD has a similar operating speed and a smaller size than the CompactFlash, while the MMC should leave the market soon. It also refers to the Memory Stick which takes last position in many tests. The ImageMaster is ahead in recording. Both in operation with CompactFlash and in case of the SmartMedia adapter it performs 1.5 times better than the PQI Travel Flash which suffers from the poor realization of operation with CF (at least). In principle, it could have jumped up with SD/MMC, but MMC is not able to provide the speed over 1.5 MB/s and SD couldn't help because of the low-speed chips - the write speed remained almost the same as in operation with USB 1.1. The Memory Stick failed once again. I can assert that the best choice for a user who needs a high operating speed is a FireWire card reader. They show excellent results and are in production over a year already, that is why all the bugs are eliminated. If the speed is not key for you (especially, if you are not going to buy high-speed cards), you care about the compatibility and have already laid your eye on the USB 1.1 reader, take a look at a new version of the bus. If the SmartMedia is not what you need ;) But if you wait for a month or two, the errors will be corrected and the card readers for USB 2.0 will become faster. Anyway, you shouldn't buy a reader with the USB 1.1 interface. If you need it only for Memory Stick, a fast bus will be of no help for such a slow model. 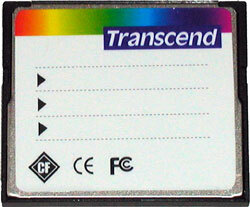 As for the memory cards, there are currently two leaders - CompactFlash and SD. Probably, we will soon get one more promising solution which will replace the SmartMedia (xD Picture Card). Today the CF is more popular and costs less, but the situation might change. As for me, I fancy for SD - they are more universal, and the CF can't be put into a compact device. In low-speed equipment the MMC performs good as well, that is why I understand why the MMC makers feel offended by Matsushita. However, in low-speed devices one can use everything, even the Memory Stick performs more or less good. Besides, I'd like to recommend Sony to turn its attention to SD, or at least develop something better than MS.